While studying at Macc Music School, he received the best vocal, best performance awards. After graduation, as a trainer at the same school, he was given a job offer but declined to concentrate on the stage work. Participate in numerous stages as back vocals of black singer such as RAY DORSEY (current drifters). Also, in addition to Franz Friedel, Emmy Jackson, Miyamae Yuki co-starring, TV Kanagawa's show appeared with Jerry Fujio and Marie Lu. Currently working as a vocalist of "Blue Emotion". In the same band, regular appearances at Shinagawa Pacific Hotel "Blue Pacific", Shinagawa Prince Hotel "Hapna" until '99. 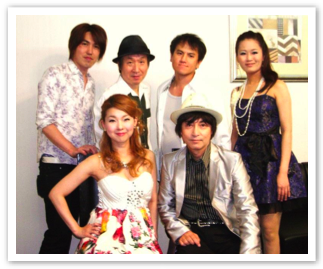 In addition to the regulars of live house, oldies house (Shinjuku Carroll House, Kinshicho thirty eight etc), events, dinner shows and other stages are done a lot. Also, the stage at the US military camp is also popular. From oldies to 70 's to 80' s Disco, Pops, has a wide repertoire.